The Headquarters of ICI, London with the 1862 suspension bridge at Lambeth Bridge. The picture illustrates ICI’s new headquarters, together with the first modern bridge at Lambeth – the 1862 suspension bridge. Awkwardly steep approaches made horse-drawn traffic dangerous and it soon became primarily a pedestrian crossing, being closed to all vehicles in 1910. Taylor is a largely enigmatic artist, famed mostly for his enduring friendship with his contemporary, Walter Sickert. Born in Leeds, his father was a successful tobacco manufacturer and left Taylor sufficient private income that he never had to work. 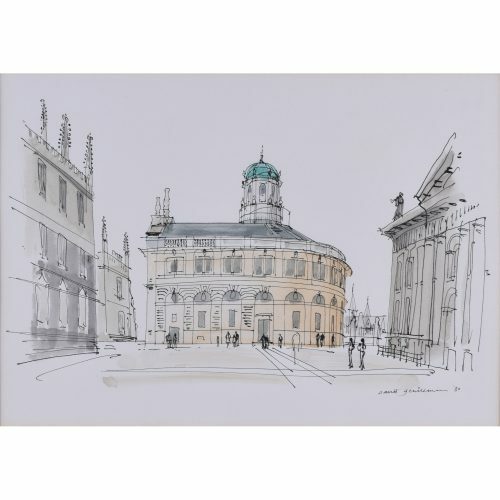 Training as an architect he subsequently went to art school in Paris and the Royal College of Art, and then spent time travelling and painting – meeting Sickert in France. In 1899 he married Hylda Matheson, but she died during their honeymoon. His first solo exhibition was held in 1911 at the prestigious Grafton Galleries and he took a studio at 18 Fitzroy Street in 1915. 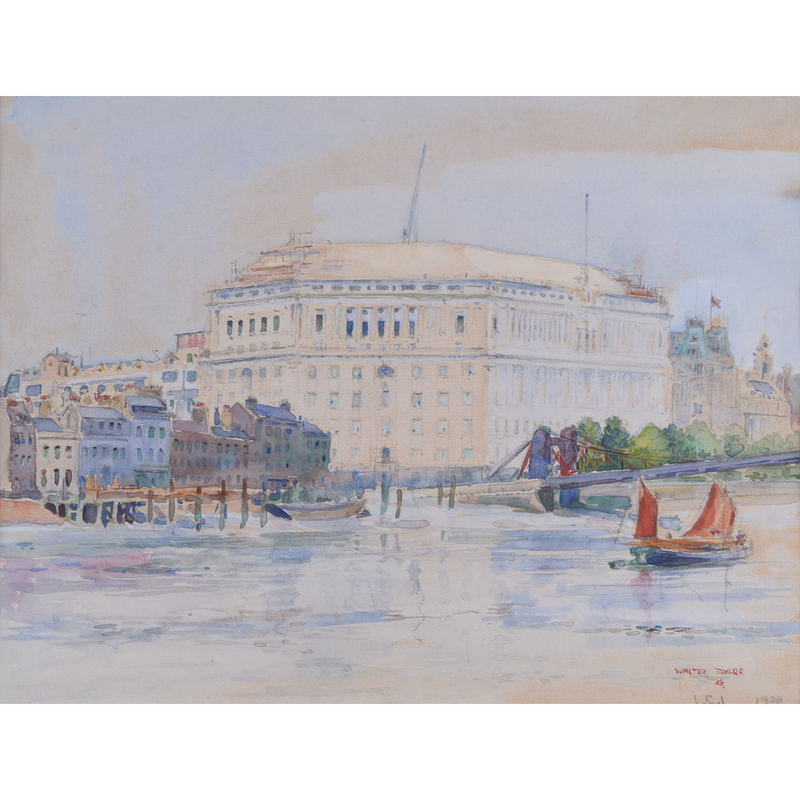 Although never officially a member of the Camden Town Group, he painted at the periphery of Sickert’s circle; he was however elected to the newly-formed London Group in 1914, serving as Treasurer from 1916-1918. 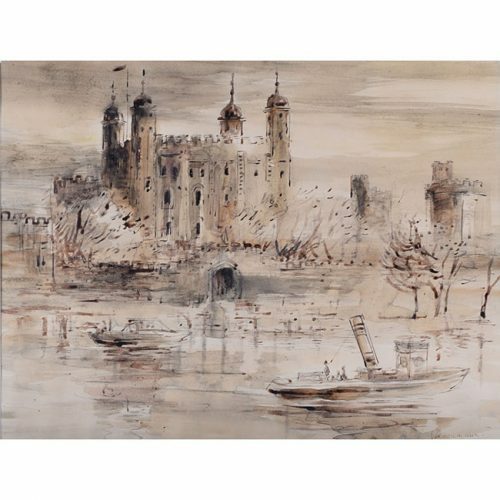 A talented artist, he mostly painted landscapes or architectural subject, his post-war watercolours being based on a bold charcoal outline with flat blocks of colour. His wealth probably prevented him from ever achieving fame as an artist; he never lacked for cash and so never had the drive to paint and sell his paintings in quality. His major contribution to the art world lies in his patronage of the Camden Town Group. 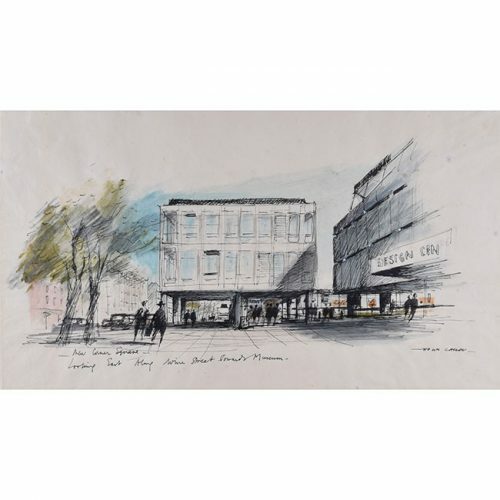 Saturday afternoons featured ‘At Home’ sales of members of the Fitzroy Street Group, and Taylor would frequently buy works, being renowned both for his impeccable taste, and for his purchases from struggling younger artists for whom his patronage was a vital source of income. Taylor’s large collection included paintings by Sickert, Harold Gilman, both Stanley and Gilbert Spencer, Matthew Smith, as well as French modernist painters such as Matisse, Bonnard, Vuillard and Dufy. 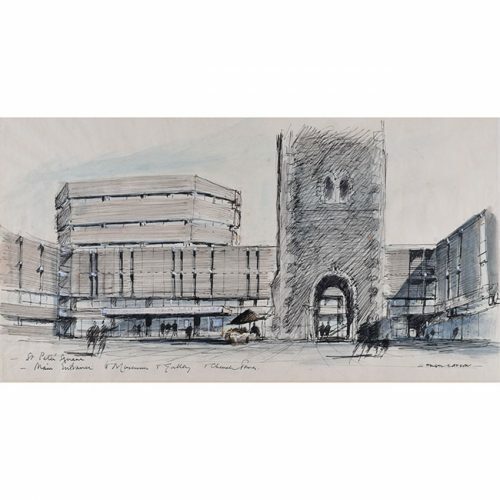 He died in 1943, and in 1944 the Leicester Galleries held an exhibition of his work. His works are in public collections including The Tate, as are many of the paintings from his collection.